Home > Local Information > Introducing … The Joey Swing! Introducing … The Joey Swing! 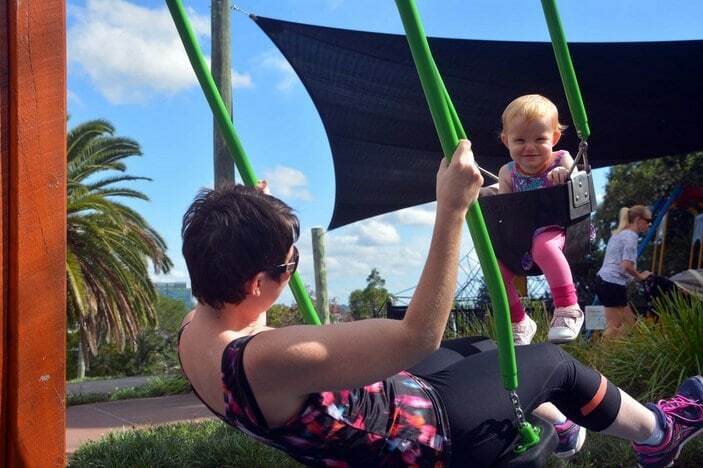 Here at Brisbane Kids, we LOVE parks and we LOVE opportunities for parents and kids to have fun together, which is why we think this latest invention is pretty AWESOME! How many times have you tried to sit on a swing and somehow hold your little one in your lap at the same time? How many times have you tried to push your child from in front so you can actually see them while they’re swinging? How many times have you wished there was a better solution out there? Well, it’s here! This is actually real and it’s in a park near us! What is the Joey Swing? 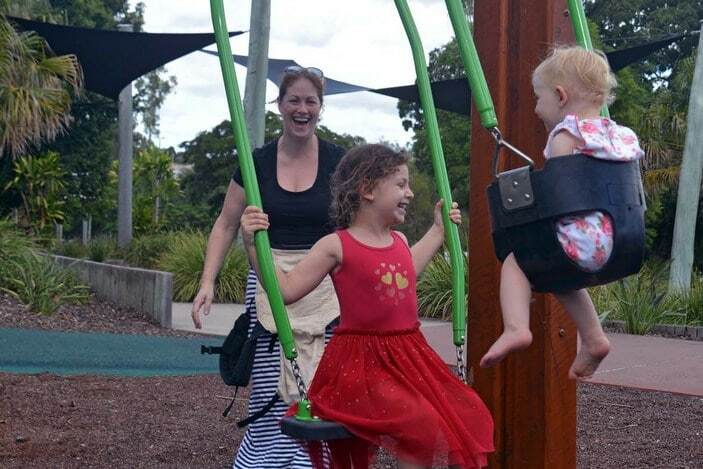 Designed by Play Works, who specialise in creating playgrounds for councils, schools, kindys and other commercial contractors, the Joey Swing is something quite different to your usual park fare. While most park equipment is designed for individual use or for kids to use together, this is an exciting new play piece that finally allows adults to be able to enjoy all the fun of the park along with their children! The Joey Swing is a dual-seat swing so that parents can ride on the swing at the same time as their child! It has a solid adult seat that is comfortable, and a baby seat that is fully enclosed, so it all feels super safe. Another thing that we love is that we get to play too! 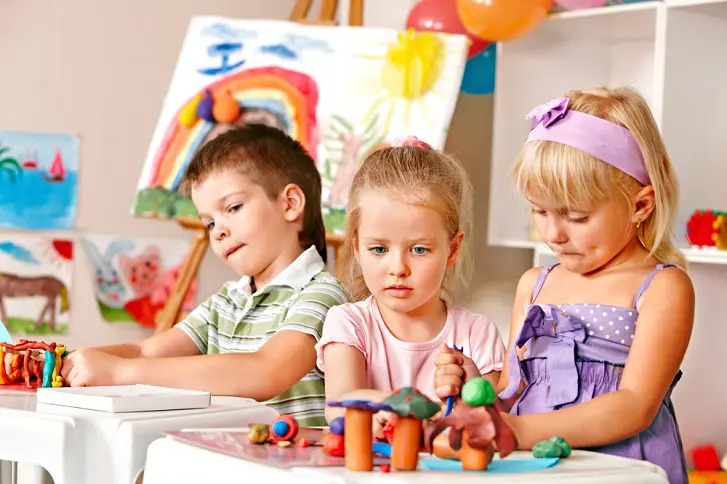 We get to join in the fun and connect with our little ones by actually doing the activity together, which is what it’s all about after all! And it’s guaranteed to bring lots of giggles! 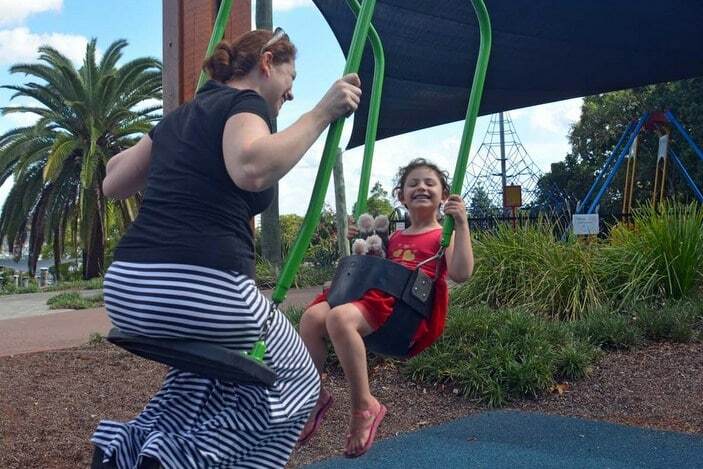 But what we love MOST about the Joey Swing is that you actually get to face your child. You get to see the delight in their eyes as they experience the dips and rises, the feeling of weightlessness. You get to see their beautiful faces when they squeal with delight as they soar into the air. You get to share those moments of pure joy together, and that’s pretty priceless! 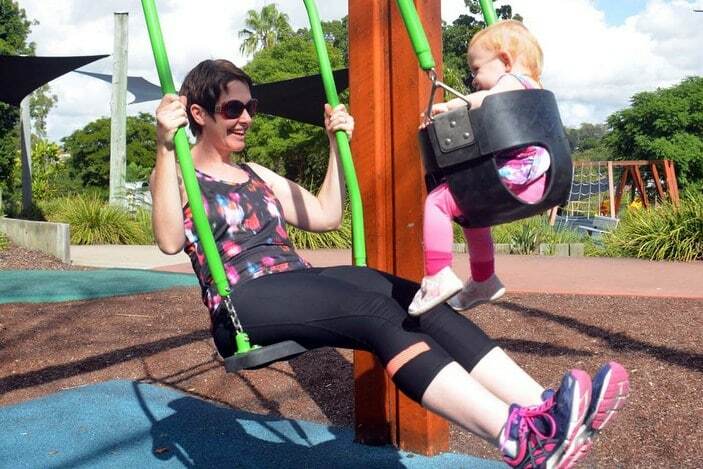 Another thing that’s great is that while the swing was first envisaged to be used mostly for adults and babies, it turns out that older kids can use the swing as well (depending on their size), so you can enjoy seeing your older child ride with their younger sibling while you can just sit back and relax! Where is the Joey Swing? The first ever Joey Swing has just been installed in Queen’s Park in Ipswich and is up and running for you and your little ones to start enjoying it together! Queen’s Park is more a destination than just a park, with things to interest all ages of kids. 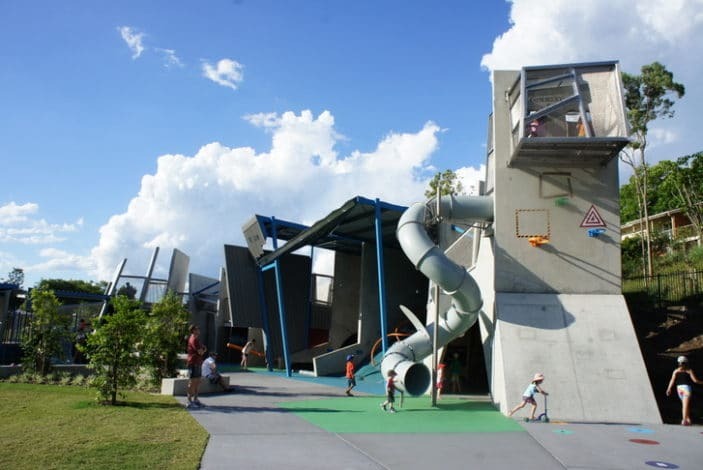 It has a state-of-the-art playground with flying fox, liberty swing, climbing walk and train. There’s also a cafe and parklands and gardens to explore, even a mini zoo with awesome animals! 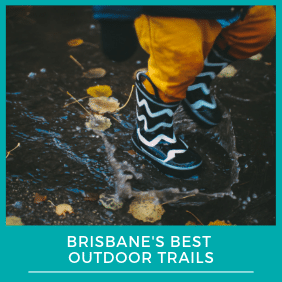 It’s definitely a must-visit park for anyone in Brisbane or Ipswich, and now with the Joey Swing we have an extra reason to check it out! All images courtesy of Play Works. Here’s hoping the Joey Swing comes to more parks near us soon! Queen’s Park is located on Milford Street in Ipswich. You can find out all about Queen’s Park in our full review here! 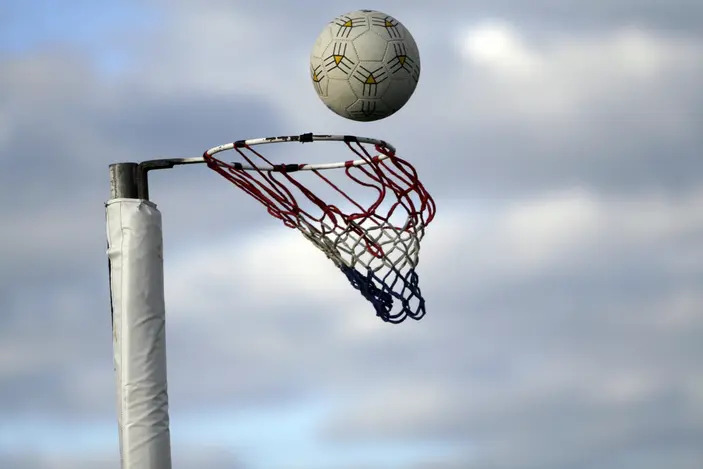 Where can kids play Netball in Brisbane?